Roger Weavil sent in these pics. "Here are two pictures of me and my wife. 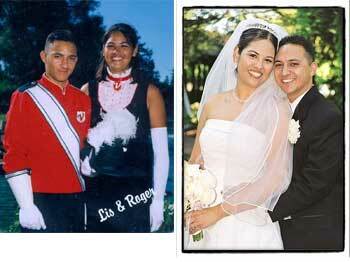 The first is when we first met in 1998, marching with the Vanguard Cadets. The next is on our wedding day six years later. We were married on May 30, 2004. I marched with the Vanguard Cadets from 1996-1999 playing soprano and cymbals, and Lisette marched from 1998-1999 in the guard." Thanks Roger!